The Department of Transport, Tourism and Sport has been advised that the Marine Institute is carrying out the annual Irish Anglerfish and Megrim Survey (IAMS 2018). The survey will be carried out from the 10th-21st April 2018 to the North and Northwest coast of Ireland in fulfilment of Ireland’s Common Fisheries Policy (CFP) obligations. 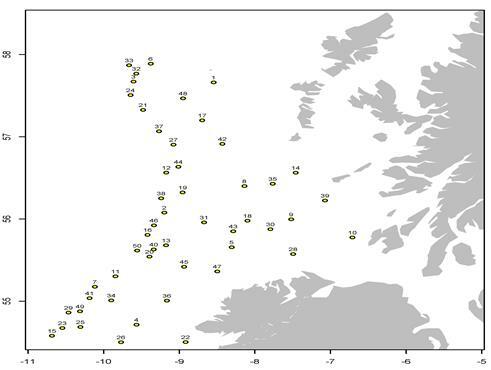 The IAMS is a demersal trawl survey consisting of approximately 50 otter trawls of 60 minutes duration in ICES area 6.a. The approximate location of these hauls is given in Figure 1 and Appendix 1 below. Fishing will take place within a 3 nautical mile radius of these indicative positions. Figure 1. Map of IAMS 2018 survey stations labelled with station numbers. The survey will be conducted by the R.V. 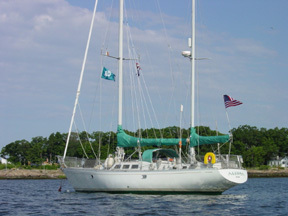 “Celtic Explorer” (Callsign: EIGB). The vessel will display all appropriate lights and signals during the survey and will also be listening on VHF Channel 16. The vessel will be towing a Jackson demersal trawl during fishing operations. The Marine Institute requests that commercial fishing and other marine operators keep a 3nmi area around the tow points clear of any gear or apparatus during the survey period outlined above. While there is no statutory provision for the loss of gear at sea, the Marine Institute will make every effort to avoid gear adequately marked according to legislation that may be encountered in the notified areas. In the event that an operator has static gear or other obstructions within 3nmi of the points listed below it is the responsibility of the owner to notify the survey managers or vessel directly. This should be communicated by identifying specifically which “Station” is of concern using the Appendix and contact details provided. It is not required to provide positional details of commercial operations beyond 4nmi of the survey points provided.